HIGHLANDS– Harris County Sheriffs Department homicide investigators are looking for clues which will lead the to the arrest of a person or person who injured a 13 year old Highlands boy in what is believed to be a drive-by shooting. Sheriffs deputies were told upon arrival by the mother that her son was in her bedroom talking on the telephone when they heard a loud noise. The son reportedly told the mother that he had been shot in the lower back. 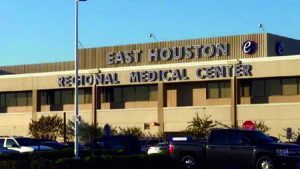 Highlands EMS transported the boy to East Houston Regional Hospitals emergency room for examination. X-rays revealed that the boy had indeed a bullet lodged in his lower back. A hospital spokesman said that because the bullet was in the fatty part of the back they chose to leave it in rather than remove it and the boy was released from the hospital. The boy reportedly told deputies that since he was in the bedroom he could not have seen the shooter. He also said that he did not known of anyone who would want to shoot him and could not offer any possible suspects. The sheriffs department homicide division is asking anyone with information to step forward and assist them. Anyone with information related to this case is asked to call CrimeStoppers at 713-222-TIPS. Callers do have to give their names.